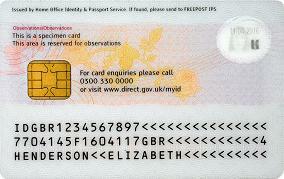 The image of the ID card for British citizens was revealed by the Home Secretary. The ID card, which can also be used as a travel document in Europe, was revealed by the Home Secretary at St. Pancras International Station in London and to residents of Greater Manchester at an event in the city center. The ID card image shows the information contained on the face of the card, including photograph, name, date of birth and signature, and the card’s design. It will hold similar information to that currently contained in the UK passport as well as a photograph and fingerprints on a smart card chip. The new UK identity cards will feature physical security features and will act as a proof of age, helping prove an individual’s right to enter premises or buy goods. They will also empower communities tackling anti-social behavior and crime by allowing local retailers, including pubs and supermarkets, to make sure they aren’t selling restricted goods to those who are underage. Foreign nationals living in the UK will be required to apply for the card, but it will not be required for UK citizens.